1. Floor and Ceiling Runners — (Not shown) — Channel-shaped runners, 3-5/8 in. wide by 1-5/8 in. deep, fabricated from No. 20 MSG (0.0329 in., min bare metal thickness) galv steel. Attached to floor and ceiling with fasteners. 2. Studs — Channel-shaped, 3-5/8 in. wide by 1-5/8 in. deep with 9/16 in. folded back return flange legs, fabricated from min No. 20 MSG (0.0329 in., min bare metal thickness) galv steel. Studs shall be designed in accordance with the current edition of the Specification for the Design of Cold-Formed Steel Structural members by the American Iron and Steel Institute. All design details enhancing the structural integrity of the wall assembly, including the axial design load of the studs, shall be as specified by the steel designer and/or producer and shall meet the requirements of all applicable local code agencies. Studs spaced 24 in. O. C. and secured to floor and ceiling runners with No. 8 by 1/2 in. long Type S-12 steel screws (one screw at each end on each side). Max load on studs not to exceed 70 percent of the max allowable axial load. Studs supplied with 2-1/4 by 1-1/2 in. cutouts punched in the web, spaced 48 in. O. C. to allow passage of lateral bracing (Item 3). Max height of studs is 10 ft.
3. Lateral Bracing — Channel-shaped, 1-1/2 in. wide by 9/16 in. deep, fabricated from No. 16 MSG galv steel. 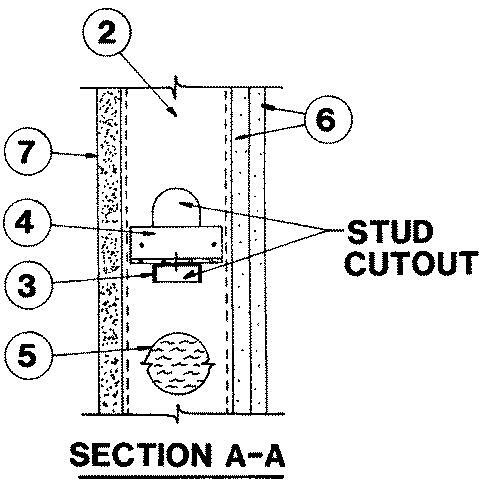 Secured to each steel stud (Item 2) with three No. 8 by 1/2 in. long wafer head steel screws and one clip angle (Item 4). One screw secured to clip angle and two screws secured to steel stud. 4. Clip Angles — 2 by 2 in. steel angles, 3-1/4 in. wide, fabricated from No. 20 MSG galv steel. 5. Batts and Blankets — Mineral wool batts, 3 in. thick, supplied in 24 by 48 in. sheets, friction fitted into stud cavities between lateral bracing. Mineral wool batts to have a nom density of 6.0 lb per cu ft.
6. Gypsum Board* — Any 5/8 in. thick UL Classified Gypsum Board that is eligible for use in Design Nos. L501, G512 or U305. Nom 5/8 in. thick, 4 ft wide by 10 ft long installed vertically. Base layer secured to steel studs and floor and ceiling runners with No. 10 by 1-1/4 in. long Type S-12 steel screws spaced 12 in. O. C. Face layer secured with No. 6 by 1-7/8 in. long Type S-12 steel screws spaced 12 in. O. C. and staggered 6 in. from base layer screws. 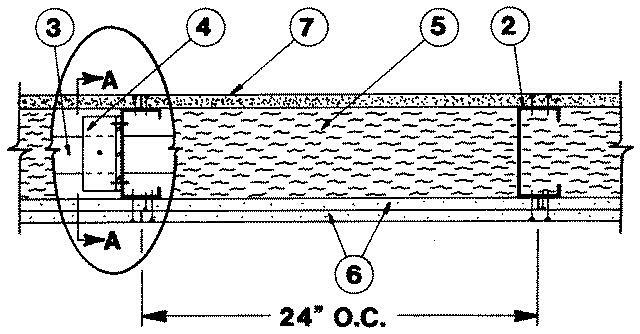 Vertical joints of face layer offset 24 in. from base layer vertical joints. 6A. Gypsum Board* — (As an alternate to Item 6 through 6A) — Nominal 5/8 in. thick, 4 ft wide panels, applied vertically and secured as described in Item 6. 6B. Wall and Partition Facings and Accessories* — (As an alternate to Items 6 through 6A) — Nominal 5/8 in. thick, 4 ft wide panels, applied vertically and secured as described in Item 6. 6C. Gypsum Board* — (As an alternate to 5/8 in. Type FSW in Item 6) - Nom. 5/16 in. thick gypsum panels applied vertically. Two layers of 5/16 in. for every single layer of 5/8 in. gypsum board described in Item 6. Horizontal joints on the same side need not be staggered. Inner layer of each double 5/16 in. layer attached with fasteners, as described in item 6, spaced 24 in. OC. Outer layer of each double 5/16 in. layer attached per Item 6. 7. Mineral and Fiber Boards* — Nom 17 mm thick, 4 ft wide by 10 ft long, secured to steel studs and floor and ceiling runners with No. 10 by 1-1/2 in. long ribbed reamer tek screws spaced 12 in. O. C. Vertical joints offset 24 in. from vertical joints of base layer gypsum wallboard. 8. Joint Tape and Compound — (Not shown) — Vinyl-based powder or premixed joint compound and 2 in. wide paper tape. Compound applied in two coats to all screw heads and vertical joints of mineral and fiber boards and gypsum wallboard. Paper tape embedded in first layer of compound over face layer gypsum wallboard.